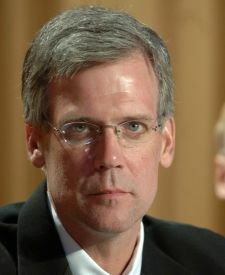 Former White House press secretary Tony Snow has passed away Saturday after a long battle with colon cancer. "The Snow family has lost a beloved husband and father. And America has lost a devoted public servant and a man of character," President Bush said in a statement on his former colleague. "It was a joy to watch Tony at the podium each day." Snow served in the Bush administration from May 2006 to September 2007, when he left to accept an offer as a commenter on CNN. He is survived by his wife Jill and their three children. He was 53.